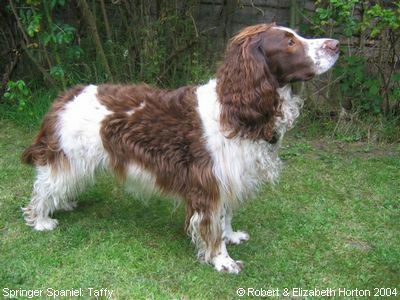 Taffy is (in 2004) a mature seven-year-old; born at Housty Kennels on 14th October 1996, he's lived with his owners in Merthyr Tydfil since just before Christmas that year. His Kennel Club name is “Housty Swordsman” and his parents are F.T.W. “Helots Predator” and “Beau Belle”, so he's a half-brother of my Poppy! What a difference from the above photo! 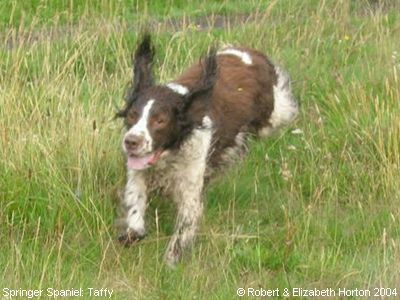 Here's Taffy looking a little more boisterous! His owners say there's nothing he likes better than running around on the hills close to home! He usually returns soaking wet or covered in mud, but he has so much fun they wouldn't have him any other way! 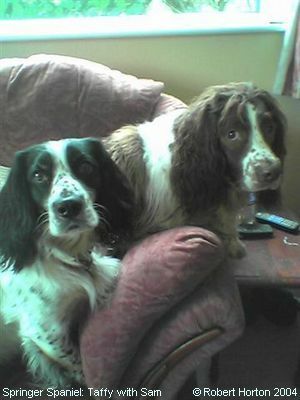 Taffy in a more reflective mood... he is accompanied by a very alert-looking Sam, a cocker spaniel - “Housty Fwlltur” - belonging to Robert and Elizabeth's daughter. Sam was born 2nd February 1999, so just a few months older than our Poppy. Like Poppy, he was a very naughty puppy... but we'll say no more about that now, as he's now grown into a very obedient dog, very loving, and a great pal for Taffy when they visit!